BRISBANE archdiocese has expressed “solidarity” and promised to work with Muslim leaders “to combat hatred and violence”, after the terror attack that claimed at least 50 lives in two mosques in Christchurch, New Zealand. 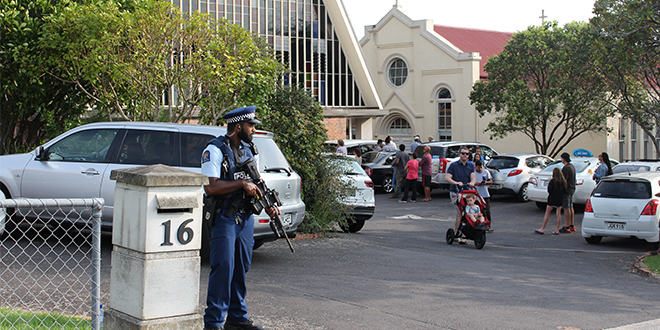 “Beyond Christchurch and New Zealand, the blood flowed right around the world; the entire human family has been grievously wounded by this violence,” Australian Catholic Bishops Conference president Brisbane Archbishop Mark Coleridge said. 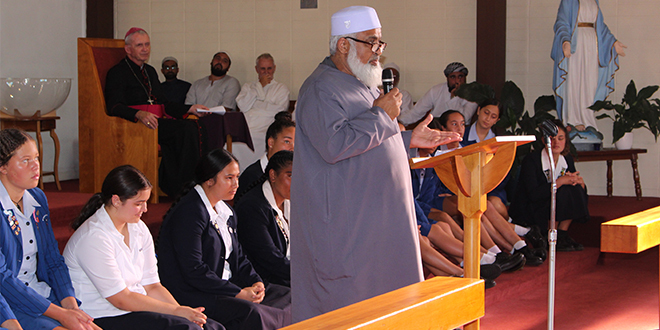 As thousands of people on both sides of the Tasman united to mourn the victims, Archbishop Coleridge joined faith leaders supporting Imam Uzair Akbar, of Brisbane’s Holland Park Mosque, on March 17, while other prayer meetings were held across the country. “We and our people pray for the many dead and for their families: may they know the peace of heaven,” Archbishop Coleridge said in a statement. “We pray for the wounded: may God protect and heal them. We pray even for those responsible for this atrocity: may they know the justice and mercy of God. In the wake of the terror shootings police were deployed across Christchurch. The shootings took place at or near the Al Noor Mosque, where 41 people were killed, and at the Linwood Mosque, where seven were killed. More people subsequently died at Christchurch Hospital. Muslims, including children, had gathered at the mosques for Friday prayers. Peaceful prayer was shattered by gunfire. Police said the alleged gunman, 28-year-old Brenton Tarrant, from Grafton in New South Wales, targeted the mosques, opening fire with semi-automatic weapons, also streaming pictures of the attack live on Facebook. The original version of the video streamed live for 17 minutes. Facebook later removed 1.5 million videos of the attack. The company said it had blocked 1.2 million of the videos at upload, meaning they would not have been seen by users. In frenzied aftermath, shocked political, religious and community leaders rallied to offer condolences and calm emotions. Vigils were held across the country, and the world. Delivering a Sunday Mass homily at Christchurch’s St Mary’s Pro-Cathedral, Christchurch, Bishop Paul Martin said “such grief is raw and real, and words are completely inadequate”. Devastated: Al Jamie mosque official Ayyub Bhikoo speaks at the prayer service inside Sacred Heart Church. His family has been in New Zealand for more than a century. “We are unable to express the confusion and pain we feel. Our grief threatens to overwhelm our community at the tragic loss of our sisters and brothers and the act of hate that has been inflicted,” he said. “Today is such a day of shared grief and pain. “In the presence of such violence and loss we cry from the heart: ‘Out of the depths I cry to you O Lord’. We know that our loving God has not caused this pain, but the freedom God gives us as a mark of his great love has been tragically misused and abused. “We gather here this morning because we are at a loss about what to do or what to say. This is the second major tragedy involving significant loss of life in Christchurch in the past decade. On February 22, 2011, an earthquake struck the city, killing 185 people. The Catholic Cathedral of the Blessed Sacrament suffered severe damage, as did the nearby Anglican Cathedral. New Zealand Prime Minister Jacinda Ardern expressed the anguish of a nation: “For those of you … questioning how this could have happened here, we, New Zealand, we were not a target because we are a safe harbour for those who hate. Ms Ardern flagged changes to gun control laws. New Zealand has about one firearm for every four citizens, and there is no ban on semi-automatic weapons. Archbishop Coleridge said Catholic communities across Australia would reach out to the Muslim communities in their vicinity. “We will work with Muslim leaders and all people of good will to combat hatred and violence in every form, to knock down walls and build bridges in the name of God who calls us to live as one family,” he said.